This picture is from an article that was in the UWO Gazette a couple of weeks ago. 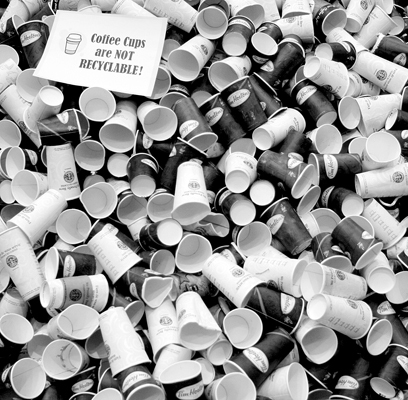 Apparently people at UWO go through about 4000 paper coffee cups a day. Free (as in speech) hardware? At the shop we’ll generate two to five of these a day. I never take one of those javajacket things on principle, but that’s really not good enough. Ever soda and every beer bottle I generate goes into the recycle bin. Every coffee, the wastebucket. Maybe it’s time I started bringing a cup. You realize of course that all those cups will compress to a few cubic inches of material right? To me anyway, the point isn’t really the amount of waste. It is that this waste is completely unnecessary.